A Green Tea You Could Easily Drink Every Day! Summary : Wow. What a tea. What the heck is there left to say? How about this...if you like mint and green tea, you'll love this tea. Period. Review : After reviewing several bagged teas in a row, and not being too terribly excited about any of them, I decided I wanted to try a new tea with high odds that I would like. So at 1am I began digging through my growing assortment of teas and stumbled across a long-neglected sampler package of Mint Green Tea from Culinary Teas. Having earlier in the day reviewed Liptons Bagged Mint Green Tea, and ending up liking it to some extent, I must confess to having high hopes for this tea even before opening the vacumn sealed pouch. Well...any doubts I may have sub-consciously harbored about this tea were shattered immediately upon opening the bag. Wow....what a aroma! Talk about mint! The mint smell in this tea is so strong, I thought it was even stronger than the loose-leaf peppermint and spearmint teas I've tried. And hold your horses here...want to talk about tea leave sizes? The leaves in this tea are so big, you could take shelter under them during an afternoon rainstorm. Well, ok, maybe that is a bit of a stretch, but the size of these leaves make the leaves of "bagged versions" of mint green tea seem almost comically laughable. Here is how Culinary Teas describes this tea...it's almost laughable. "A refreshing and cool mint flavor on green tea. A worthwhile and heady combination." Worthwhile? Cool? Talk about deliberate understatement! Most tea companies way overplay their tea...so I found it amusing that Culinary here made this tea seem like some downtrodden step-child locked in the basement. The simple fact is this...this tea is awesome. Period. This tea perfectly blends green tea with a strong but somehow "perfect" mix of mint. This tea, at the end of the day, really does definie what a Mint Green Tea should taste like! That all said, if you prefer a mint green tea with a "less minty taste," then let me suggest the Moroccan Mint Tea from Dragonwater Tea Company. The Moroccan Mint tea has a wonderful mint taste to, it is just on the "lighter side." Recommendation : Absolutely! Anyone who wants to try a real good green tea...and who likes mint...absolutely, positively should run over to Culinary Teas and pick themselves up some. This tea is delicious and can easily be drank day after day after day. This tea is a superb way to get your "antioxidants" and satisfy your taste buds, too. And if you like the Tazo Zen Green Tea, you'll like this tea even more, as the flavor of this tea is similiar but far, far stronger! Lastly, if you want mint in your green tea, but are worried that the taste of this tea may be a bit "too minty", then try out the Moroccan Mint Tea from Dragonwater, which has a wonderful flavor too but isn't as strong in the mint flavor department. Brewing Instructions : Use 1 teaspoon of tea leaves per cup. Truthfully, use a bit more, since the leaves are huge. Pour water with a temperature of 180 degrees over leaves. Let brew for 3 minutes. The leaves in this tea are powerful enough that you can use them 1-2 additional times, although do expect some flavor loss if you do this. 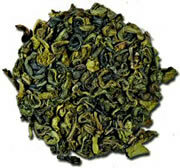 Adagio Teas Cherry Green Tea : A wonderful introductory green tea, this tea offers a light flavor with a hint of cherry.